Kevin Campion, a lifelong resident of the Pacific Northwest, is founder of Deep Green Wilderness and Orion’s most recent caretaker. Captain Kevin believes strongly in a sailboat’s ability to capture the imagination and engage with the environment. He holds his 200 Ton Masters License from the US Coast Guard and is a PADI certified Rescue Diver. After earning his captain’s license and a degree in evolutionary biology, Kevin headed out to sea. Since that day he has crossed two oceans and sailed a variety of boats on four of the seven seas working as Captain for Salish Sea Expeditions, Beam Reach and Camp Four Winds, and as engineer for the Sea Education Association and the Ocean Classroom Foundation. With Deep Green Wilderness, Captain Kevin sees a way to combine his love of sailing with his passion for teaching ecology and conservation. He enjoys introducing people to the wealth of diversity you encounter when you leave the dock and hopes his work with Deep Green Wilderness will promote responsible stewardship of our public lands and waterways. 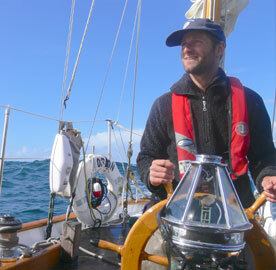 Kevin’s keen eye for wildlife and passion for the environment serve him well aboard Orion. Off-duty, Kevin serves on the board of directors for the SeaDoc Society and has been known to entertain the crew with his guitar or tales of poisonous frogs and secret surf spots from his travels in Central America.